In brown, blue or green. 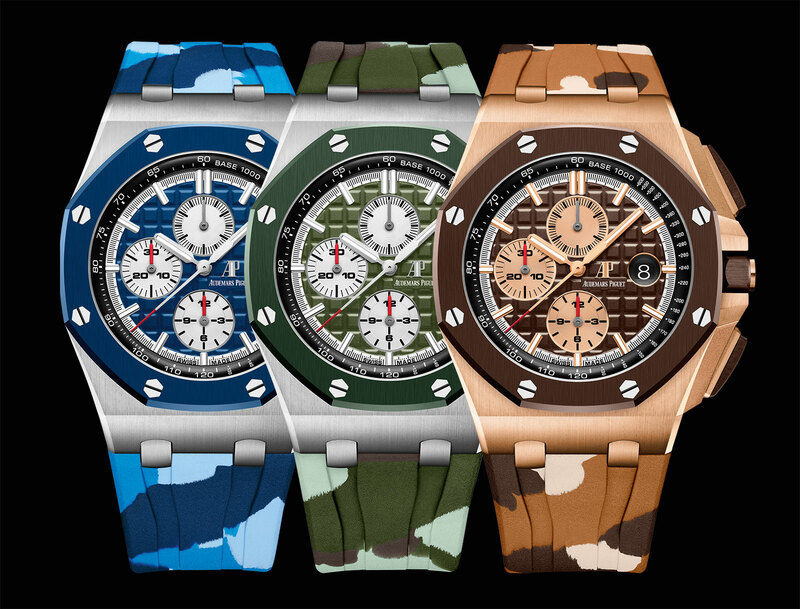 After the successful Royal Oak Offshore “Camo” with a beige dial launched earlier this year, Audemars Piguet (AP) is continuing with the camouflage pattern strap theme in three new colours. 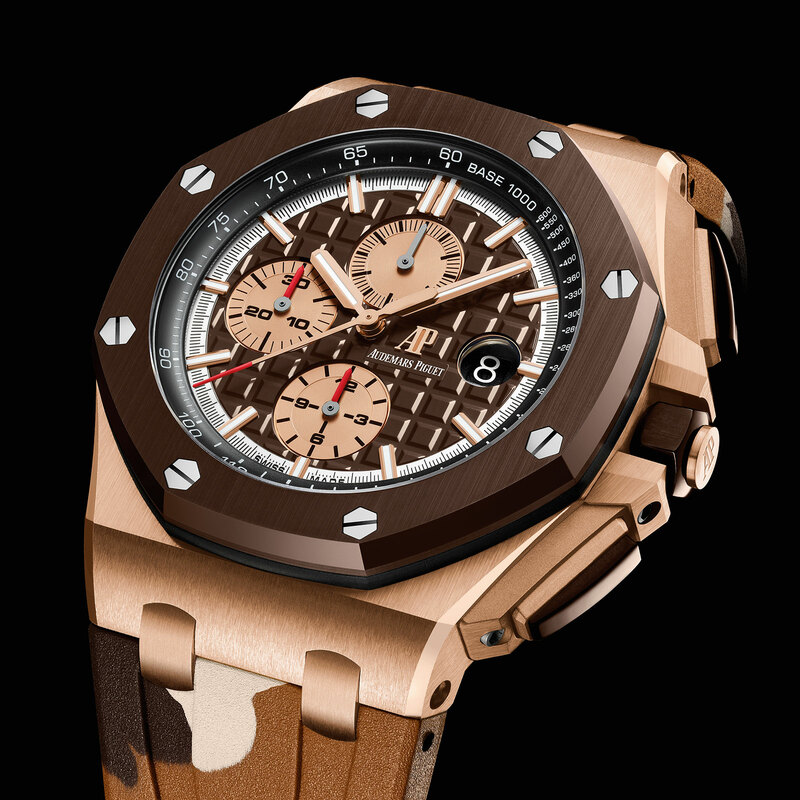 The first is in 18k pink gold with a brown dial and bezel – the use of brown ceramic is a first for AP – matched with a caramel and brown camouflage rubber strap (ref. 26401RO.OO.A087CA.01). The other two are in steel. The first is forest green (ref. 26400SO.OO.A055CA.01), and the other is in blue (ref. 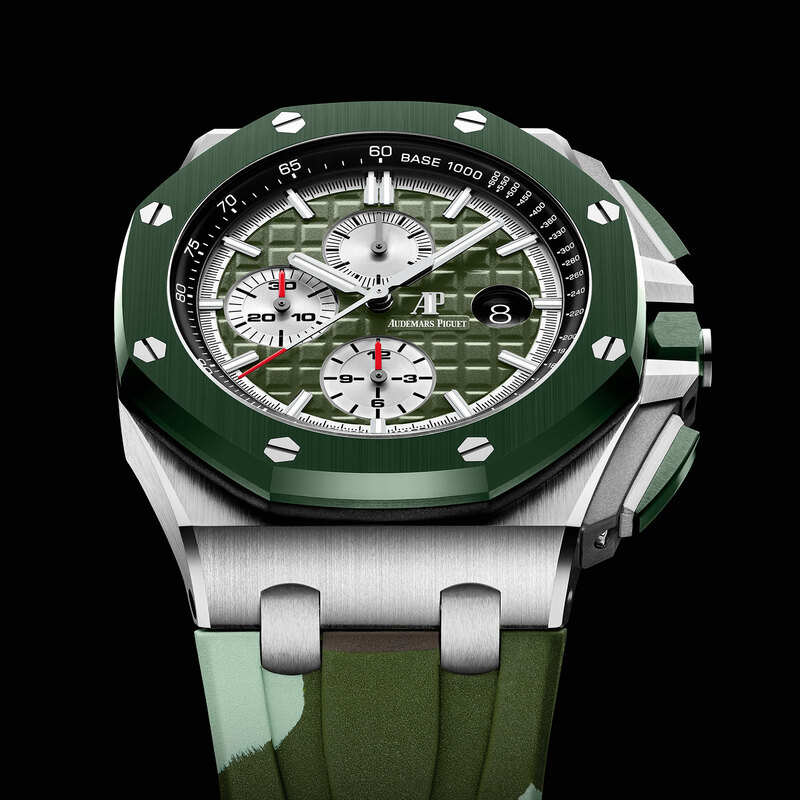 26400SO.OO.A035CA.01), again with matching camouflage straps. While the colours are new, the specs of the watch remain the same. The case is the standard 44mm Offshore case, with the bezel, chronograph pushers and crown in ceramic coloured to match the dial, which is finished with the extra-large Mega Tapisserie chequerboard guilloche that’s synonymous with the Offshore. Inside is the cal. 3126/3840, which is AP’s in-house automatic cal. 3120 topped with a Dubois-Depraz chronograph module. It has a 50 hour power reserve. And for those who prefer a more restrained look, each of the new Offshores is delivered with a solid colour rubber strap, in addition to the camouflage pattern band. 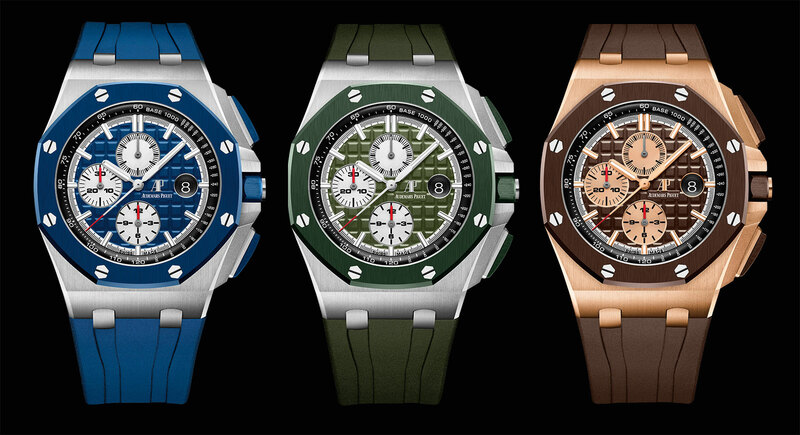 The Royal Oak Offshore Chronograph “Camo” will be available in 2019. In steel it’s priced at US$31,000, or S$43,400, and in gold, it’s US$45,900, or S$64,400. SIHH 2017: Introducing the Audemars Piguet Royal Oak Offshore Diver "Funky Colour"
Hammered yellow gold and a mirrored dial. An edgy look on its birthday. 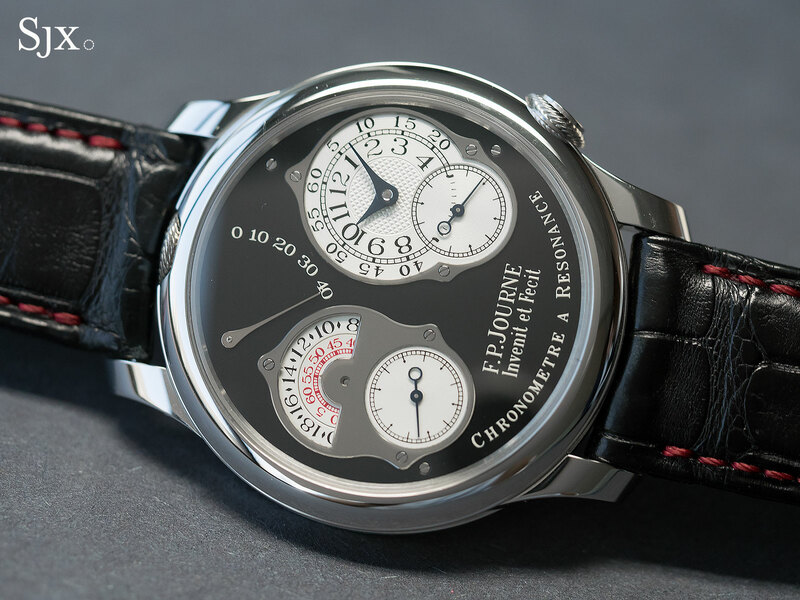 With his signature tourbillon going to be replaced in 2019 after 20 years, Francois-Paul Journe will say goodbye to the Resonance a year later, again after two decades. Relying on the physical principal of resonance to improve timekeeping – by have two balance wheels oscillating in resonance with no mechanical link between the two – the Resonance is arguably F.P. 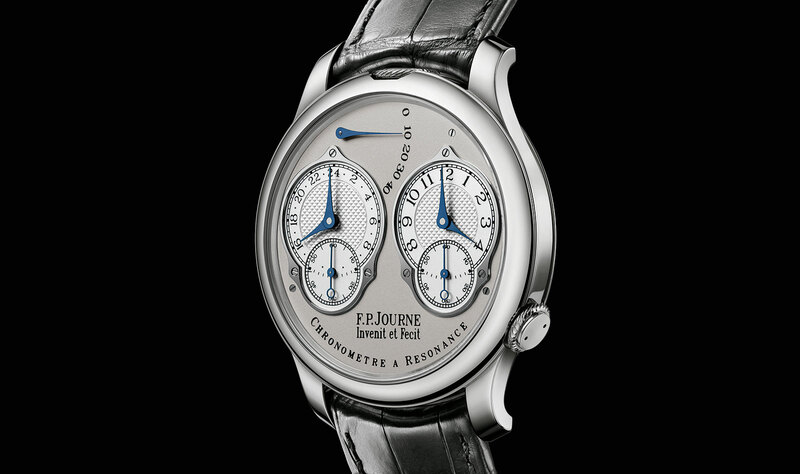 Journe’s most original wristwatch. Come 2020 the Resonance will be replaced by a watch that operates on a similar concept but is totally new. To mark the 20th anniversary of the Resonance, F.P. 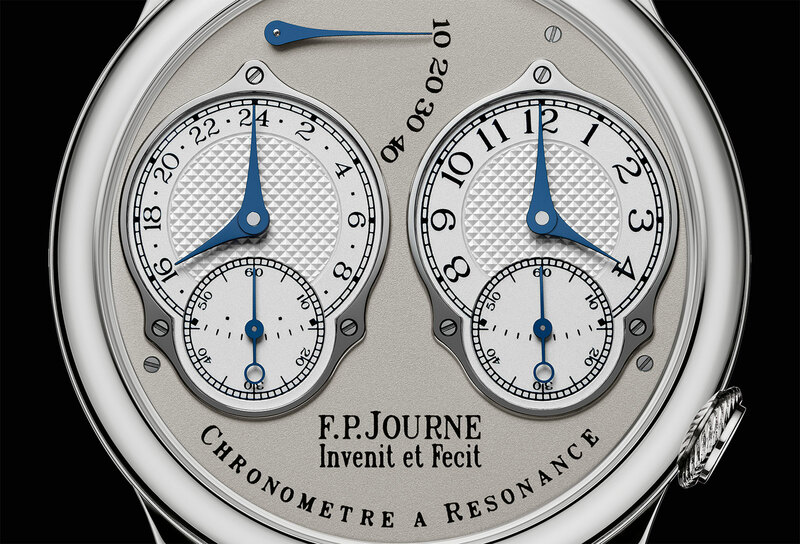 Journe has announced a special edition that will be produced in 2019 – for only one year – that formalises what the Resonance was originally: a symmetrical, dual time zone watch. The Resonance with 24-hour dial makes it easy to distinguish between local time, which is on the right sub-dial, and home time, now presented on a 24-hour scale. While the symmetry of the dial design has been preserved, a quality lost with the current generation Resonance, the sub-dials will no longer be in sync when indicating the same time. The rest of the watch is identical to the current Resonance. That means a 40mm case, available in platinum or rose gold, with either a strap or matching bracelet. And aside from the new gearing for the 24-hour sub-dial, the cal. 1499.3 inside is also the same. 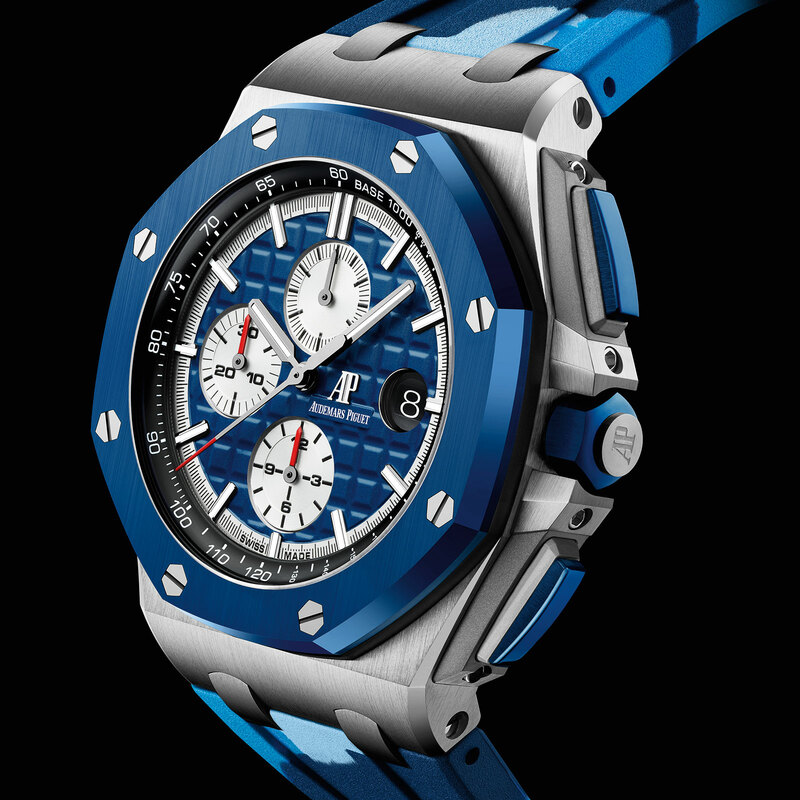 It’s hand-wound with a 40-hour power reserve, and like all current F.P. 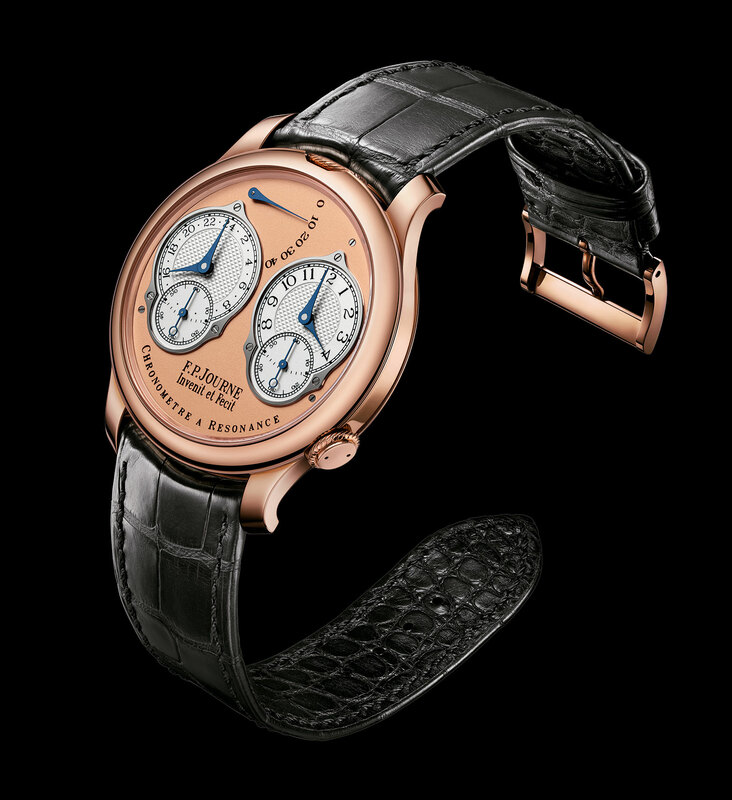 Journe movements, has its bridges and base plate in 18k rose gold. 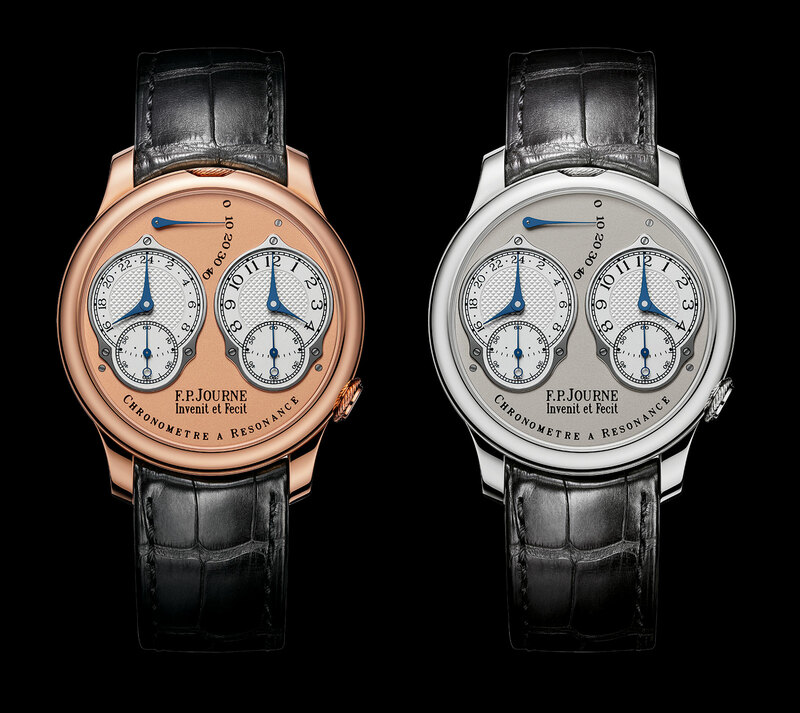 The Resonance 24-hour is priced at SFr80,200 in rose gold and SFr84,100 in platinum, including Swiss taxes. It’s already available at F.P. 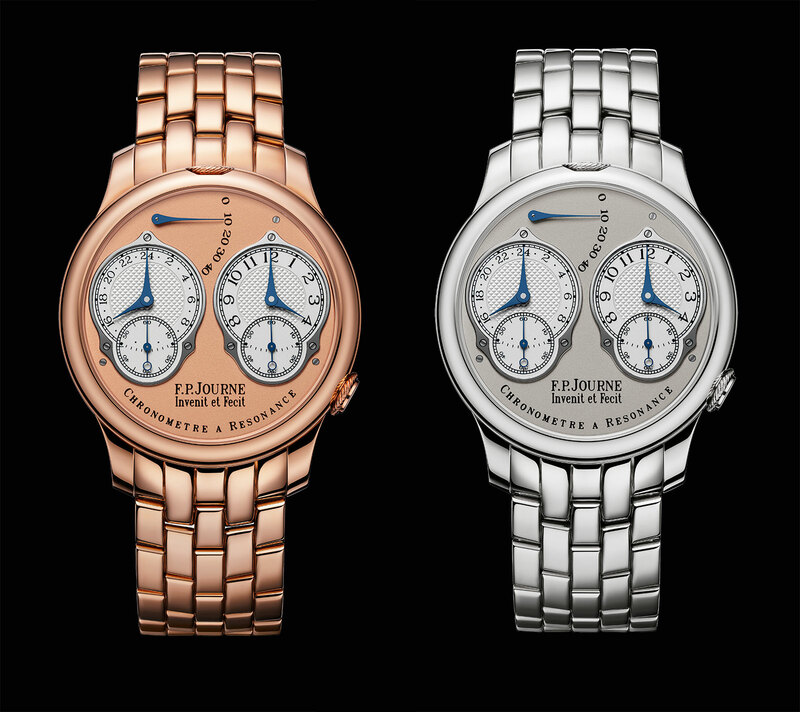 Journe boutiques, and will also be available at retailers in 2019.